Sponsors of Bank of Ireland Open Farm Weekend are on the final countdown to the annual event which takes place on Saturday 16th and Sunday 17th June. Established in 2012, Bank of Ireland Open Farm Weekend is delivered by Ulster Farmers’ Union and is sponsored by Bank of Ireland UK and supported by NFU Mutual, ASDA and Cranswick Country Foods. Bank of Ireland Open Farm Weekend Chairman Barclay Bell said, “I would like to record our thanks to all the main sponsors for their continued financial support enabling us to deliver this very worthwhile initiative. We are grateful to our title sponsor Bank of Ireland as well as NFU Mutual, ASDA and Cranswick Country Foods. Fourteen farms including three new hosts will welcome the public onto their land including Churchview Farm, Ballyward, Co Down who specialise in rearing goats, Mossbrook Farm outside Carryduff which is also home to Farm House Treats and Murray’s Farm, a poultry farm based in Aghalee. Each farm event is unique with a vast range of activities on offer, including cookery demonstrations, farm walks, food tastings, interactive quizzes, meet the animals and apple orchard tours to name just a few. On Saturday 16th June, 14 farms will be open whilst on Sunday 17th June, which is also Father’s Day, 9 farms will take part. Visitors are asked to wear appropriate clothing and footwear to the farms that they visit and to also note that dogs are not permitted. There will be a free competition at each farm to win a hamper of local food produce kindly sponsored by the Ulster Farmers’ Union, for one lucky family to take home with them. As the Ulster Farmers’ Union is celebrating their centenary in 2018, Bank of Ireland Open Farm Weekend participants will be raising money for the Centenary Charity Air Ambulance NI, which exists to provide high quality critical care where and when it is needed most. The weekend would not be possible without the help and resources of Young Farmers’ Clubs of Ulster, Food NI, CAFRE, DAERA and the Northern Ireland Food and Drink Association. For more information on the initiative, follow on Twitter @BOIopenfarm and like Open Farm Weekend on Facebook. This year, visitors are encouraged to share pictures of their time on farms using the event hashtag #boiofw18. 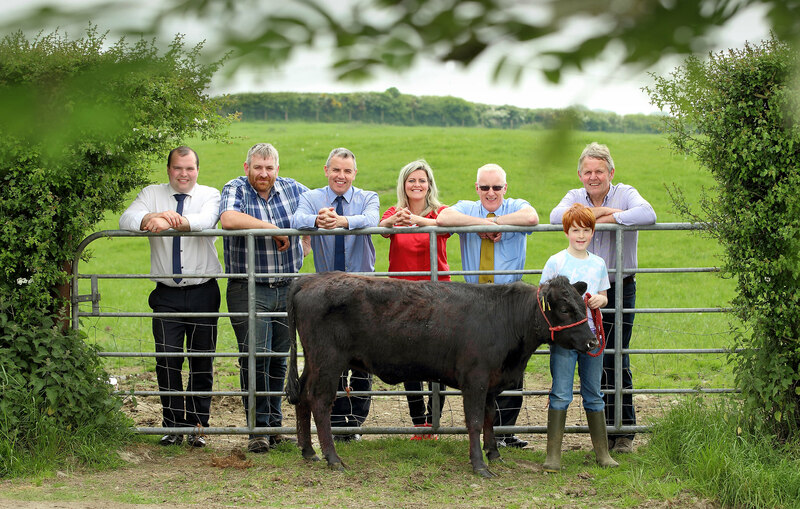 Damien Tumelty and Jack Gibson of Castlescreen Farm, Downpatrick, along with Dorothy the Dexter calf, welcome Bank of Ireland Open Farm Weekend sponsors to their farm. From left, Richard Primrose, Bank of Ireland Agri Business Manager, Joe McDonald, Asda NI Corporate Affairs Manager, Colleen Milligan, Air Ambulance NI Area Fundraising Manager Down & Armagh, David Cairns, NFU Mutual and BOIOFW Chairman, Barclay Bell. Castlescreen Farm is one of 14 farms opening up as part of Bank of Ireland Open Farm Weekend 2018 on Saturday 16th and Sunday 17th June.